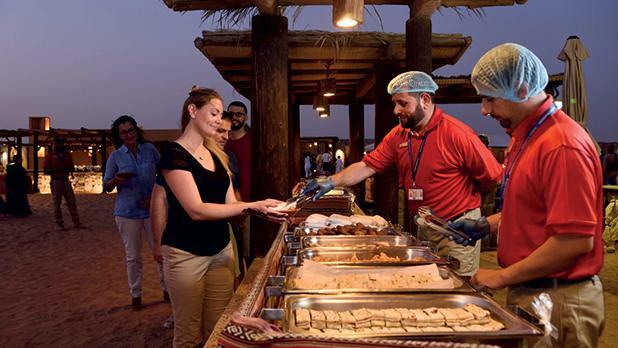 While I’ve never had any reservations about visiting Dubai, it’s never really been high on my list. Surprisingly, the forward-looking city built on sand won me over in less than 48 hours. Here’s why. 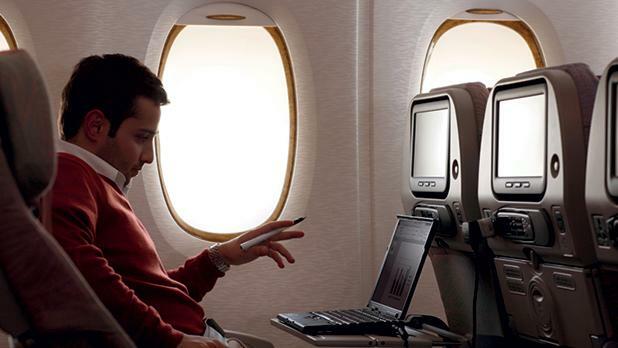 A trip to Dubai starts with an Emirates flight that takes approximately seven hours. While that may seem like a long time, it is cushioned by the comfort of the Boeing 777 planes that make up the Emirates fleet. 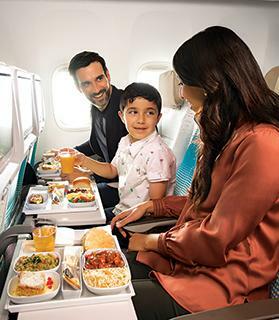 The perks – even in Economy class, although Business and First are also available – are quite numerous, and include more legroom than the average plane, decent meals, unlimited drinks, charging ports, and ICE, the entertainment system that gives you in excess of 3,500 channels including some of the latest movies, TV series, news, live sports, games and music. Once I land at Dubai International Airport (DBX), the true Dubai experience begins: a huge space, enclosed in white metal and glass, with palm trees, monumental columns and gold decoration. It is the perfect façade for a city that can sometimes feel surreal, larger-than-life and, to a certain extent, superficial. Yet, as I make the long journey from the plane to passport control, the staff I meet soften the initial overwhelming feeling by adding a kind and helpful human touch to the coldness of the expanse that is the airport. As a Maltese passport holder, I just get a stamp upon arrival (no visa necessary), and quickly head out to meet my driver who takes me to Le Méridien Hotel & Conference Centre located just five minutes away. Following a friendly chat with the receptionist, I am taken up to my room: a deluxe room measuring approximately 32m2 with the most comfortable queen size-bed imaginable. Overlooking one of the five pools in the hotel, the room feels like home the second I close the door behind me for the night. My first day in Dubai begins with a late breakfast by one of the pools of the hotel. Everything from a full English to dim sum is there; in fact, I'm upset I hadn't gone down earlier to give myself the time to try more stuff. Following breakfast, I meet with my guide, the very knowledgeable Mahmoud, and our driver, Naeem, both from Arabian Adventures. Our first stop is Old Dubai. Now, Dubai has a long history – archaeology has so far dated the site to around 7,000BC – but, Old Dubai is pretty much gone. 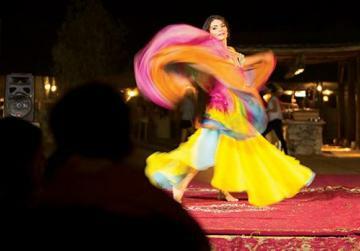 What there is, apart from a few genuinely old forts and historical buildings, is tradition. This can be clearly seen in Al Fahidi Neighbourhood located near Dubai Creek. Here an open-air museum right by the wayside has life-size exhibits that give you a taste of what life was like during the mid-1800s. The barjeel (traditional wind towers), constructed from stone, teak, gypsum, palm wood and sandalwood are the most awe-inspiring part, but a walk down the narrow pathways gives you an idea of Dubai before it became one of the Emirates. From here, we head to the Spice Souk by abra (a type of motorised water taxi that can hold up to 20 people). It’s a fun way of seeing the Creek and it only costs 1 Dirham – approximately €0.25! For spice enthusiasts like me, the Souk is a must see. Bags full of whole nutmeg, dried ginger, dried and smoked lemons, flower buds (and, more surprisingly, natural Viagra) line the paths of the roofed market. Indoors, most vendors have even better goods with saffron, vanilla pods and camel milk-chocolate being some of the delicacies. One word of advice here, is to always use a calculator and to haggle. This is followed by a quick pop to the gold market – an extraordinary glittering scene that starts with a window displaying the world’s largest certified gold ring. That is not for sale, but I’ll tell you what was: pretty much anything you can dream of at the Dubai Mall. To see the skyscraper capital that continues to rise higher by the year in all its glory, I finish off my first day by going aboard a traditional wooden dhow (floating restaurant) that takes me down the Creek. 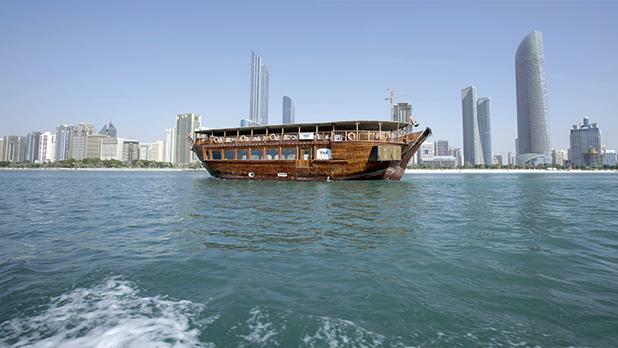 Priced at around €40, the two-hour cruise comes with a full buffet, Arabic coffee and entertainment. 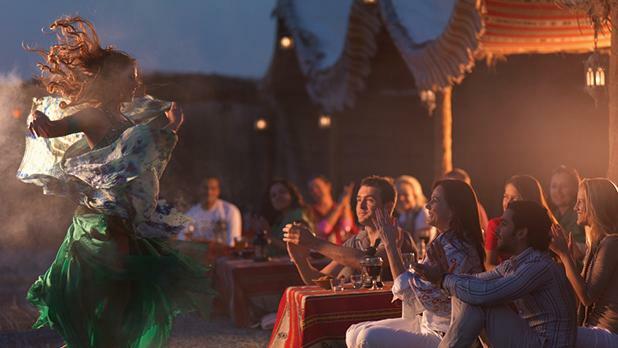 The food is decent, but the views and the entertainment – a traditional tanoura show that had quite a weird and unexpected twist at the end – definitely leaves an impression! On the second day, I start by visiting the Dubai Frame in Zabeel Park. Opened in January this year, the 150-metre tall monument is clad with 15,000 gold-coloured stainless-steel sheets. The result is that, even in the humidity- and dust-induced haze of the city – it’s the middle of a desert after all – it stills glimmers and glistens. As an attraction, the Frame – which, like many other things in Dubai, I am told was the idea of the current Sheikh – is quite spectacular. Priced at around €10, it’s a great way to see how one of the world’s most forward-looking cities is evolving. And that is one thing that needs to be said about Dubai: there are many construction sites, but it’s never noisy, dirty or dusty. Things just seemingly pop out of nowhere! Even traffic, though there is some, seems to be unaffected by the multiple construction sites. But not all of Dubai is like that. 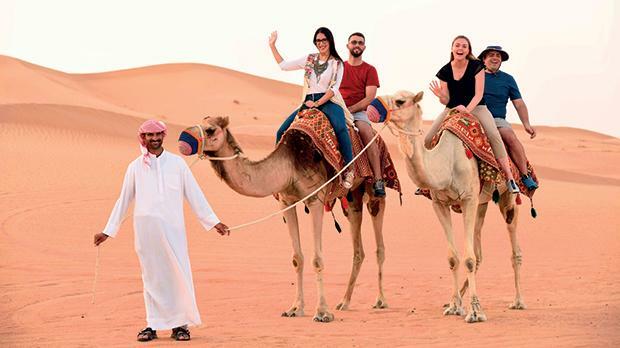 In fact, my last stop is the Sundowner tour by Arabian Adventures, which takes me to the world-famous dunes. Passing by a camel hospital and a camel racing track, the four-by-four takes me to a parking lot just outside the nature reserve, where the tyres’ pressure is reduced for us to be able to drive on the sand. 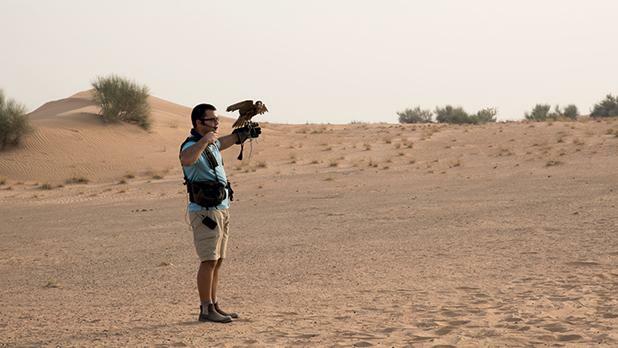 The first stop here is for a falconry show, which is then followed by off-roading and dune bashing. 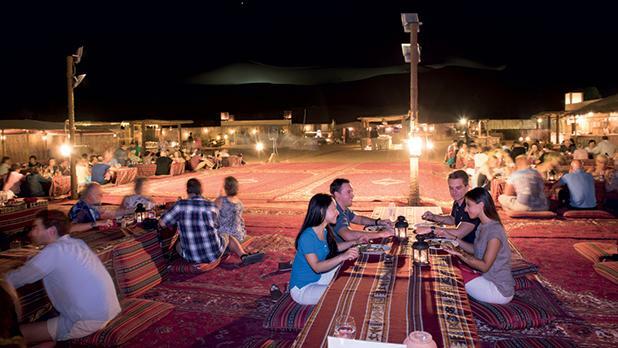 Finally, I am dropped at a Bedouin-style camp in the middle of desert, where I can go camel riding, enjoy a three-course buffet cooked out in the open, and finally spend three magical minutes stargazing in the desert. Now, there are many other places I would have liked to visit in Dubai, including seeing the city from atop the Burj Khalifa, visiting the seven-star Burj Al Arab, and taking a tour through the Municipality museum or The Union House in the Etihad Museum. But, as we drive back to the hotel, I realise how wrong my pre-suppositions about Dubai were. Sure, Dubai can feel like one giant theme park but everything works like clockwork and you can barely point out any flaws or shortcomings upon first sight. Of course, we all know that that can’t be true… No city or country is that perfect. But what’s definite is that Dubai is a very clean and safe multicultural city, where mosques and churches sit side-by-side. 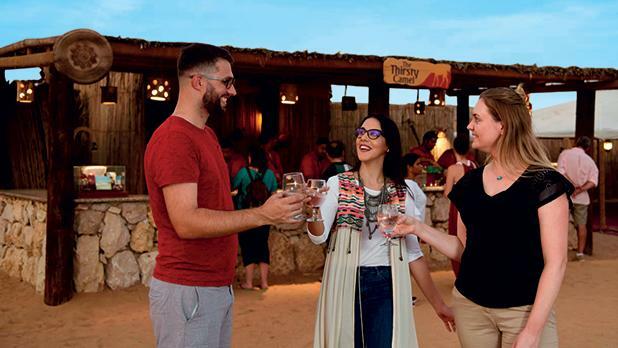 As a country that gets 10 million tourists a year, Dubai is today a modern metropolis that has a lot to offer both the rich traveller who wants the best of everything and a family looking for a few days away from the monotony of daily life. So… Would I return again? I wouldn’t mind if I did! Iggy was a guest of Emirates Airlines in Dubai. This feature first appeared in the Sunday Circle magazine. Browse the magazine for free using the TOM Mag app, available for download in the Apple App Store or Google Play Store.